Accepting the 2014 J. Evan Goulding District of the Year Award on behalf of the Durango Fire Protection District are from right Bud Smith, legal counsel; Kathy Morris, vice president of the board; Dan Noonan, chief; and Jim Barrett, secretary-treasurer. 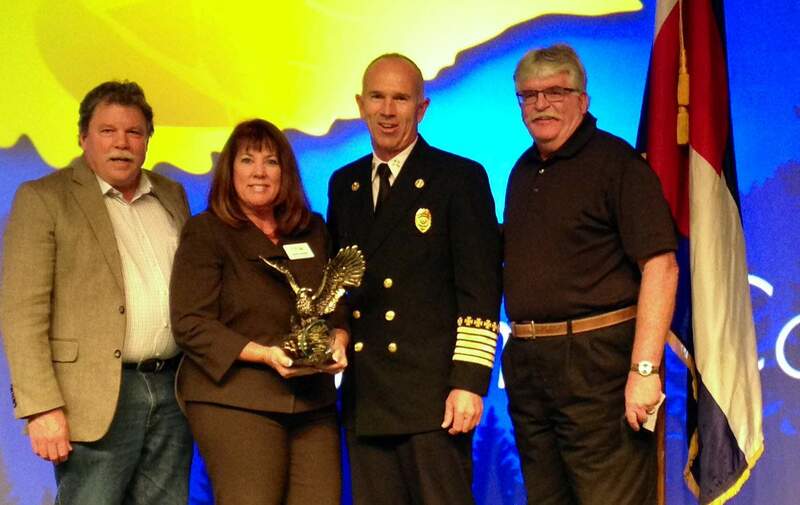 The Durango Fire Protection District recently received a statewide award for its work to unify local fire districts. The Special District Association of Colorado honored the local district with the 2014 J. Evan Goulding District of the Year Award out of 1,500 member districts. “They were chosen for their efforts to consolidate and their efforts to serve their community,” said Ann Terry, executive director of the association. The effort to bring the different local fire districts together first started in 1996 when there were three separate districts, Durango Fire Department, Animas Fire Protection District and Hermosa Cliff Fire Department. The effort reached its conclusion with a ballot effort last year to consolidate local taxes that now support the consolidated district. “We continue to persevere and do away with the duplication of government,” DFPD Chief Dan Noonan said. Noonan gave all the credit to the medics and firefighters, saying the community chose to stand behind the consolidation because of their good work.